Our simple focus is to ensure your relaxation, restoration and transformation. At Saffire Freycinet Tasmania, it’s not all about luxury accommodation. Of all the moments you will experience, it is that moment you set aside to book your Saffire day spa treatment in Tasmania that has the potential to relax and revive you most fully. At Saffire’s Day Spa, we draw upon Tasmania’s natural elements with bespoke luxury products to renew your energy and transform the way you look and feel. In fact, we promise to return you to the world utterly renewed. At Saffire Freycinet Tasmania, our highly skilled therapists and masseurs have the skill to help you achieve your highest health and wellness potential. Following your Spa Saffire consultation, your therapist will prepare a program of day spa treatments and therapies to reflect your personal needs and preferences. Men’s treatments are also one of our specialties. Many of our wonderful spa products were designed exclusively for Saffire Freycinet, and all are available for you to purchase and take home. This Australian-made, natural Naturaceuticals range is suitable for all skin types. LaGaia believes less is more. Less chemicals. Less fine lines. Less dry, dull skin. Less stressed-out complexions. LaGaia designed our exclusive bespoke range – for retail and amenities. Combining results and luxury, Payot uses a specific beauty enhancing methodology which is a unique combination of movements and the most effective natural active ingredients. Maintaining the integrity of the skin at all times, the complex ingredients used in all Payot treatments are unified through bio-technology and bio-affinity providing ultimate hydration and anti-ageing effects. Spa Saffire also stocks Becca Cosmetics and Smitten Merino clothing. 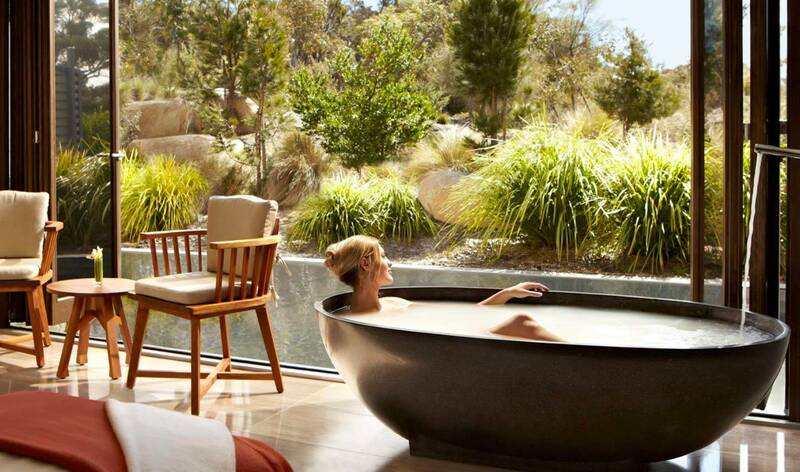 At Saffire Freycinet, everything we do is aimed at improving your wellbeing. We understand that everyone is different, and as such we have a number of programs and options that will cater for your physical – and spiritual – needs. All suites have yoga mats, and individual and personal yoga classes can be arranged on site. We also have full gym facilities, so you don’t need to interrupt your personal workout rituals. We have activities to suit all lifestyles. If you’re a jogger, we’ll be more than happy to point you in the right direction for a run along the beach or through picturesque bushland. Of course, it’s not all about exercise. Relaxation is vital for stress relief. We have meditation classes available, a revitalising tea menu and a relaxing and rejuvenating spa regime. Sumptuous hammocks are also available for use in your suite courtyard. If it’s healthy menu options you need, the executive chef at our luxury lodge will be more than happy to design a menu around your requirements.